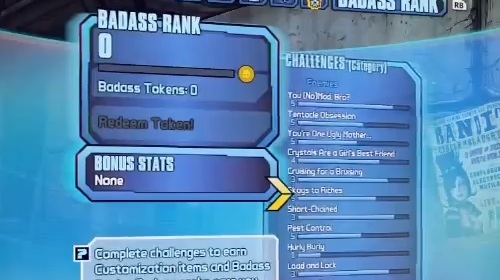 Borderlands 2's Badass Rank is a brilliant addition to the game. It's similar to an Achievement or Trophy system, but it acutally does something. Unlike a 100k gamerscore or a trophy count, the Badass Rank adds several small but satisfying stat bonuses to all of a player's Borderlands 2 characters. It's something that's built up over the course of dozens of hours of playing the game. I'm sure many of you have become quite familiar with the system. Now imagine that you go to load up your game, but something is amiss. Your character and gear are unchanged, but your Badass Rank is now zero. You can see that challenges are compete, but you have no credit for them. You'll have to play through each challenge again, earning no bonuses until you've caught up with your previous progress. Oh, and all of your customization skins and heads are gone, too. Yeah. This is happening. Our engineers are looking into this, and the information you've provided has proven to be a great resource while we investigate. At the moment, it seems to be a fairly rare issue and we'll keep you updated on when we resolve it. The bug has also wiped Badass Ranks on the PC and PS3 versions of the game. Hey Gearbox, it's really hard to get me to care about imaginary numbers. Microsoft and Sony managed to do it, and you did, too. Briefly. I really enjoy this game, but nothing kills digital love faster than lost progress. If this happens to my Badass Rank I'll probably run screaming at the nearest living thing I can find (that's not my wife, children, or dogs) and punch it to death. That means my one, lone house plant may be in for a world of hurt. If your Badass Rank has been Zero'd you should probably check out the Gearbox Forums. Hopefully a fix will come soon. Until then, I'm not turning on the game. Probably. Maybe. Ok, I'm playing right now. I just won't turn it off. There. problem solved. Borderlands 2 is out now on the Xbox 360, PlayStation 3, and PC. It supports two player local co-op, four player online co-op, and combo co-op.